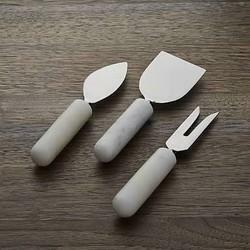 Exporter of a wide range of products which include handcarft chopping board, marble cutting board, wood marble spoon rest, marble cutlery and marble handle cutlery. As an ace manufacturer, supplier and wholesaler of Marble Cutting Board, we have marked our name very strongly in the market. Cooking becomes a whole new fun experience to have when the cutting and chopping part becomes easy and handy. We allow the task to be simple by providing this cutting board that lets the user cut fruits and vegetables with ease. 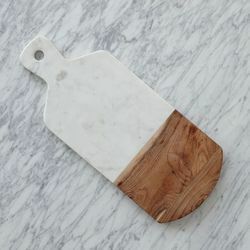 We are the leading supplier of Wood Marble Spoon Rest made available to our clients at competitive prices. 9 inch x 3 inch sppon rest mango wood torantoo marble used. 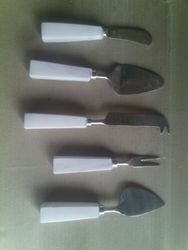 We are offering of Marble Cutlery and many more item like Fork and Knife Handles, Cutlery items. It is available in various sizes as per the client requirement. Best for kitchen use and serving spoon, best steel & marble used well polished.